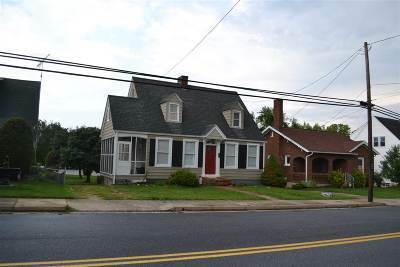 ** TEXT LISTING AGENT TO SHOW 540-241-0445**This charming and tastefully updated Cape Cod is looking for a new owner! Lovely hardwood floors throughout living areas. Ceramic tile in kitchen and baths. Ground floor offers spacious living room with built in shelving aside the brick hearth fireplace with gas logs. Accommodating dining room right off kitchen. Kitchen has been updated recently with new lots of cabinets, corian countertops, matching stainless refrigerator, dishwasher, built-in microwave and dishwasher. Ground floor bedroom and full bath. Upstairs you'll find two very spacious bedrooms and full, updated bath. Great screened in side porch. Sunroom/laundry area off rear. Full unfinished basement for storage.